Some of you may have noticed that we like to visit various boat shows, and also frequently report about the ones that we have visited here in this blog. Some time ago we actually got a question, if we are looking for a new boat from the boat shows. The answer is no, we don't have any plans for a new boat at the moment. Despite some keel issues lately, we are happy to keep on sailing with our trusty old lady. She is, in my opinion, capable of taking us anywhere that we could imagine, but let's face it: a 29-footer is a rather small boat for longer cruises, so most probably she is not going to be our last boat either. However, the timing is not right for selling at the moment, because of the low market situation and the investments that we are making this year. Thus, visiting boat shows and reading various articles from boating magazines is merely a hobby, since I like to keep up with what's new in the boating world. It is needless to say, that sailboat design has evolved a lot just during the last twenty or thirty years. However, not all of the development is positive, since in my opinion, the design philosophy has changed too much towards the living comfort in the harbour, which is often achieved at the cost of seaworthiness and kindliness. However, the idea of this blog post is not to argue whether a modern or traditional boat is better than the other. Both design philosophies clearly have their pros and cons, so the question depends on personal valuation and needs. What I would like to discuss, are some of the observations that I have made at the boat shows for example, and compare those to my own experiences of owning two, more or less traditional sailboats during the last six years. Modern cruising boats can roughly be divided into more performance oriented cruiser/racers and pure cruising boats. Pure racers are out of the scope of this blog post, since their design philosophy is often so different. 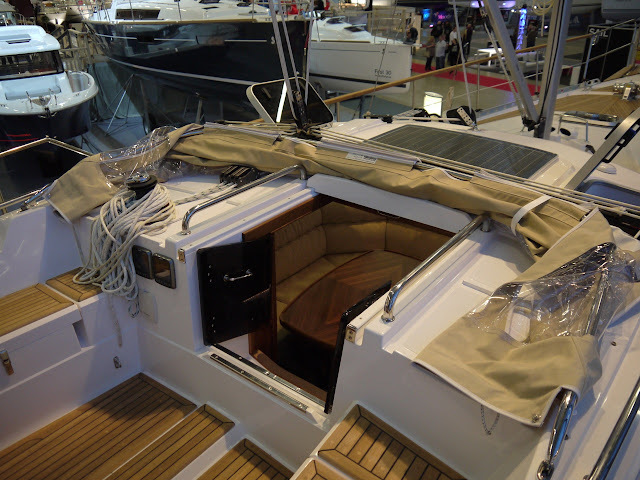 One of the most interesting boats, that we checked out at Helsinki International Boat Show a couple of weeks ago, was the new Beneteau First 30, which is a good example of modern C/R-boat. 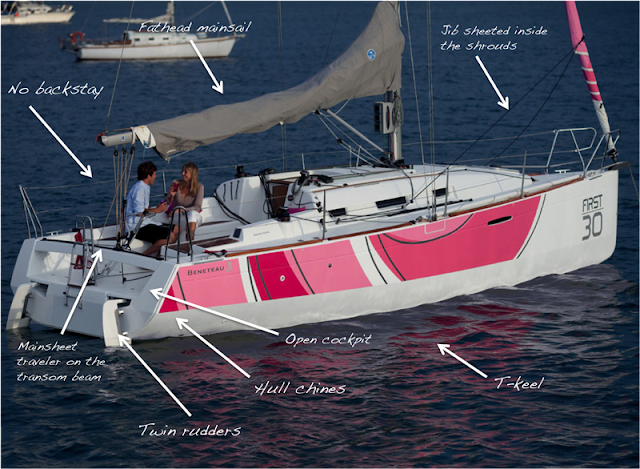 She is designed by the famous Volvo Ocean Race designer Juan Kouyoumdjian, and there are some obvious similarities to modern VO70 boats. Perhaps the most visible examples of those are the hull chines, twin rudders and the T-keel. 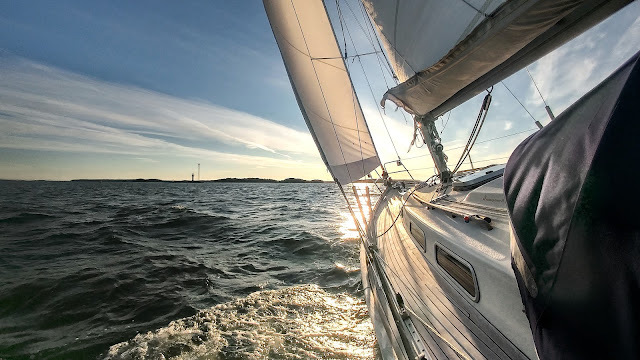 Some time ago, the Finnish boating magazine Vene tested Elan 350 RP — also a twin-rudder boat — which scored high points on the control under sail. Indeed, one potential problem with beamy and flat bottomed boat with only one rudder, is the loss of control, when the rudder raises out of the water at higher heel angles. So the twin rudder construction is clearly a definite plus in this respect. Another great thing is having a spare rudder in the case one would fail. In my opinion, the second rudder is much more useful addition, than nowadays more popular twin wheels but only one rudder concept. However, I am skeptical of having a T-keel in a cruising boat. 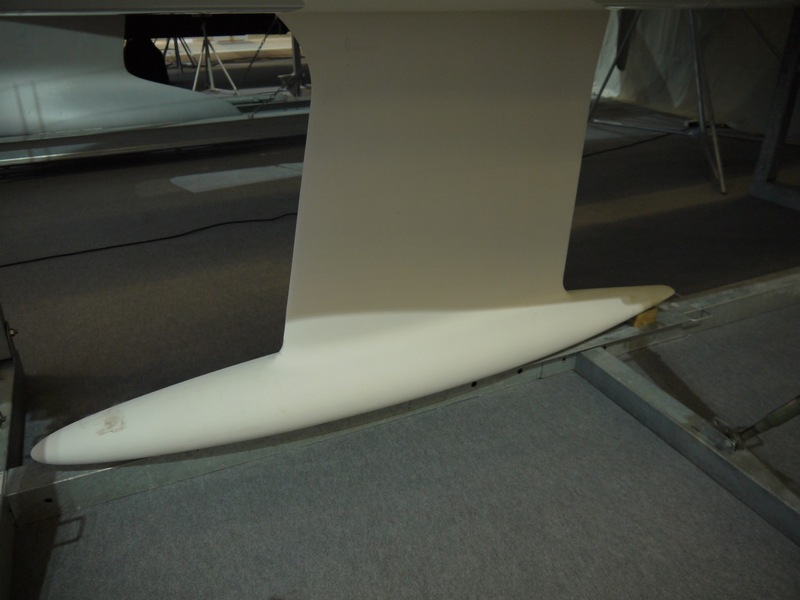 In the Yacht Design Course, held in Turku last November, a study was presented, where the T-keel showed no significant improvement on the computer modelled performance of the boat compared to the normal fin keel with similar draft and center of gravity. However, this study had some limitations, so this is not probably the only truth out there, but at least, I am not convinced of the idea of having a fishnet or buoy chain catcher in the cruising boat for the sake of marginal benefit in the speed. Another important issue, that I would be looking into very carefully, if buying a boat with T-keel, is how the bottom and keel/hull attachment are reinforced. It is very important for a cruising boat to be able to withstand even a hard grounding without a serious structural damage. In general, a longer keel spreads the loads over a larger area, whereas short keel with a large bulb at tip of the keel puts enormous forces to the area where the keel meets the hull. However, for pure racing boats, where zero point one knots gain in the speed is a big thing, the T-keel is probably an optimal choice. The boat designers are constantly looking for ways to make sailing easier and more comfortable. As the size of the boats has been rising a lot during, say the last twenty years, this has often meant adding electrical winches and furling sails, which makes things easier but increases electricity consumption and/or complexity. When looking some of the modern boats, one can see range of small improvements and innovations. This is kind of a learning curve effect: one manufacturer comes up with a solution which is valued by the customers, and others will soon copy that or bring their own solution to the problem, and quickly the feature spreads throughout the industry. Let's take the example of a common problem: when sailing the cockpit easily turns into a messy snake's nest, if one is not pedant with the halyards and sheets. Furthermore, the mainsheet traveler in the cockpit is often in the way and can be a safety risk for the crew. 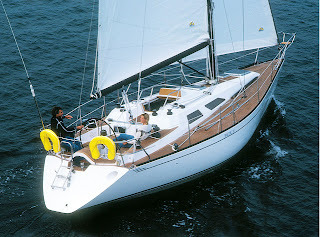 In modern cruising boats, the trend in the recent years has been to make the cockpit (or a part of it) line-free, which is achieved by shifting the mainsheet traveler fore or aft of the cockpit and leading the halyard and reef lines to the aft part of the cockpit. halyards and the mainsheet located in the front part. Note the small bridge deck in front of the companionway. I think that many sailors know the difficulty of getting the cockpit table or the companionway hatch board out of the full cockpit locker. As this exercise needs to be repeated often many times during the day, many manufacturers have addressed this issue by adding fixed cockpit tables and foldable or drop-down companionway doors. Another thing that has changed is the design of the companionway (or the main entrance to the cabin). Previously, many offshore boats had bridge decks in front of cockpit to prevent water leaking into the living quarters, in case the cockpit is flooded. Also the cockpits were smaller, so when filled with water, it would not affect the boat's stability too much. For example, older Swans had often two small cockpits, and a bridge deck for safety reasons. Nowadays, the design philosophy has changed and the bridge decks are pretty much gone. 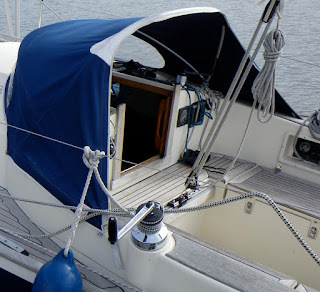 On the other hand, many modern boats are equipped with open cockpits, which drain much quicker, so the cockpits can be larger, which is a nice thing in the harbour, but probably not as safe at sea though. One more thing that I would like to talk about are the swimming or bathing platforms. Having sailed mostly with boats that do not have one, I can certainly appreciate the rationale behind the platform. For example, boarding or de-boarding the dinghy is inconvenient and even risky from the swimming ladders, especially if there is swell. Therefore, bathing platform will be included in the wish list, when looking for the next boat. However, nowadays, many of the cruising boats have a lower-able bathing platforms, which is again something, that is nice to have in harbours or anchorages, but perhaps not the most practical solution at the sea. At least it makes using the wind-vane steering impossible. Furthermore, some boats with this concept do not have any boarding ladders available, when the platform is raised. It is a potential safety hazard, if one cannot lower the ladders from the water! There were some of my observations on the modern sail boat design. As I said in the beginning, the modern sailboat design has improved many things, but not all of this development is positive in my opinion. However, I understand that one should spend a lot of time on the water sailing different boats in order to get a picture on, how different design features work in the practice. In this sense traditional features are well tested, whereas some of the newest trends and innovations may suffer from childhood problems. How about you, are you a modernist or traditionalist when it comes to the sailboats? Nice treatment of the subject. Re seaworthiness and reliability v.s. ease of use - a personal experience, fortunately in mild wind. We were sailing in a moderate, 1-reef breeze. The wind started to die, so it was time to increase sail area. And dang it, the roller reefer jammed! Turned out that the halyard end of it was a bit dirty and all it needed was a little lubricant, but the issue was that I had a sail up, with two rounds on the reefer, and no effective way of getting it down. Gentler back & forth and a little brute force did the trick, but mind you this was in a dying wind and very calm seas. Lessont learnt: When you put a sail up, be damn sure you can get it down! Observation two, about open-ended cockpits and family cruising: There water bottles, shows and other small items often on the cockpit floor. Fortunately ours is a traditional Scanmar, and these objects stay in the cockpit. Observation three, also on the cockpit and protection against following seas: when a wave slams your rear, it is nice NOT to have the wave enter the cockpit. Galley - the modern galleys are sure nice in the port. Lots of open space, windows etc. How about on the sea? We have a fairly good one, and yet it is difficult to say fetch pizza from the fridge without letting go of both hands. Fortunately, the conditions were not too bad, when your roller reefer (I presume that it was a fore sail?) jammed. But the situation, you describe, is a good example of, why I don't like the idea of having a furling main sail. Well, I guess that it is a rationale solution for bigger boats, and there are probably many sailors happy with their furling sails, but to my ears, having a main sail jammed in a blow, sounds,...well, not too tempting! In case of the fore sail, the pros of furling sail outweigh the cons in my opinion. About the open cockpit vs. closed one. I guess that the points you made regarding the open cockpits are pretty much the reasons, why lower-able bathing platforms are so common nowadays. They work kind of like a closed cockpit at the sea and open cockpit in harbour/anchorage. So in this respect, they are handy, and I can see why they are getting more and more popular. Personally, I have my doubts as I mentioned, and prefer the 'traditional' transom platform where the cockpit is closed.